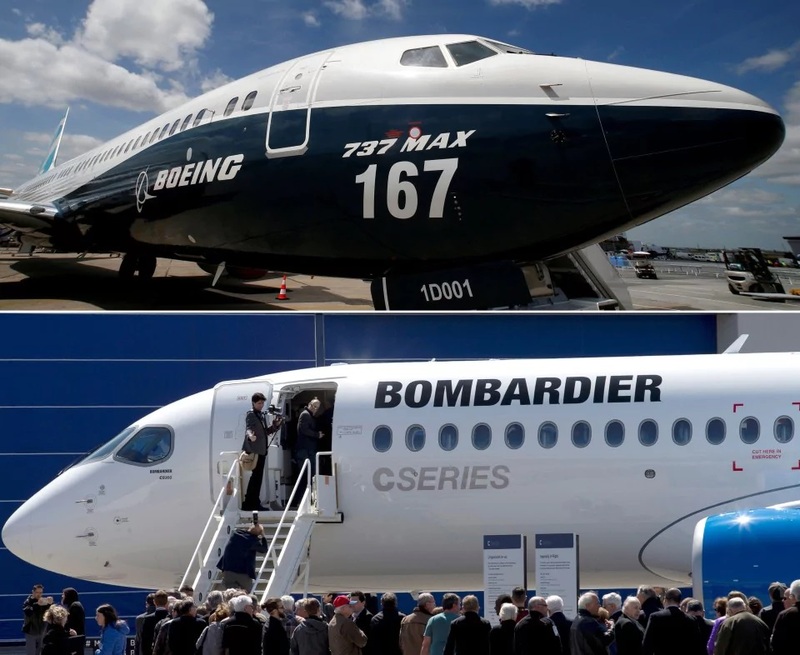 Canadian jet-maker Bombardier announced Monday that it is selling a controlling stake in its 100-150-seat C-series jetliner to European manufacturer Airbus, just weeks after the U.S.
Commerce Department moved to impose 300 percent tariffs on the plane. The companies also said they will expand the plane’s production to a new facility in Mobile, Ala., a move that could help it avoid the import duty. Executives from Airbus and Bombardier touted the deal’s U.S. job-creation potential. The deal included no up-front cash payment, a possible reflection of the plane’s enormous production costs. When the deal closes Airbus will own just over half of the C-series plane, Bombardier will own 31 percent and a Canadian state investment agency will own the remaining 19 percent. The combination significantly complicates what had been a three-way trade dispute between the United States, Canada and Britain. With Airbus’s ownership of the C-series aircraft, the dispute now touches France, Germany and Spain, where Airbus has a significant presence. The dispute started in May when Chicago-based aerospace manufacturer Boeing asked the U.S. Commerce Department to investigate allegations that Bombardier is selling the C-series plane in the United States at an unfairly-low price and doing so with the help of illegal government subsidies. Bombardier had earlier struck a deal to sell 75 C series CS100 jets to Atlanta-based Delta Air Lines. In two separate rulings over the past few weeks the U.S. Commerce Department ruled in Boeing’s favor on both counts, imposing a preliminary 300 percent tariff on Bombardier planes. The International Trade Commission, a quasi-judicial U.S. agency that has the final say in such disputes, is expected to issue a final decision on the matter in February. Bombardier and Airbus started discussing a potential sale in August, three months after Boeing first filed its tariff petition with the Commerce Department, an Airbus executive said Monday. “We’ve been extremely fast compared to other programs at Airbus,” Airbus chief executive Tom Enders said. In its published reactions to Airbus and Bombardier’s combination, Boeing sought to cast the deal as a blatant attempt to circumvent U.S. trade law. In a Monday evening call with reporters, executives from Airbus and Bombardier insisted the deal was motivated by a strategic business considerations and not a desire to avoid the tariff. Still, they recognized the added benefit of potentially avoiding the import duty. “It’s not intended to circumvent anything, but the fact is that when you produce an aircraft in the U.S. it’s not subject to any U.S. import tariff rules,” Bombardier President Alain Bellemare said. Trade experts question whether using an Alabama production facility would necessarily allow Airbus to waive the tariffs on the C-series plane. Much of the work of producing the plane comes down to assembly, with the actual components stretched across a global supply chain. But the combination could also give Bombardier new political clout in the United States, possibly making the import tax politically difficult for the White House. Airbus already operates a 53-acre facility in Mobile where it has produced the A320 narrow-body commercial jetliner since 2015 — the company’s first U.S. production facility. As part of the announcement Monday Airbus said it will set up a second production center in Mobile, a move that could shift some of the plane’s future job creation potential from Quebec to the United States. That could give the C-series another ally in Congress, where the tariff already faces resistance. In an October letter to the International Trade Commission a bipartisan group of four U.S. senators and three House members said they oppose the border tax. “This destroys the trade complaint and guarantees the success of the C-series aircraft in the U.S.,” said Richard Aboulafia, an aerospace analyst with Teal Group. Others said it is unlikely that Bombardier chose to embark on a combination purely because of the Commerce Department’s tariff decision. “When a partner in a venture pays nothing to get on board it means you were in trouble to begin with,” said Loren Thompson, an aerospace consultant whose think-tank gets some funding from Boeing.